Republica | Stylised illustrative portraiture lives here. Everyone in business should look their best and project themselves in a positive way to their customer and client base. It’s a fact. Whether it’s a corporate PR portrait, a profile picture for Linkedin or other social media or just a great headshot Republica is here to take care of your needs. These images are shot using portable lighting and paper backdrops which can be easily set up on location in your workplace for example. Shooting with lighting gives the images impact. I’m sure you would agree they are striking. Please do get in touch to discuss your corporate/business portrait/headshot requirements. 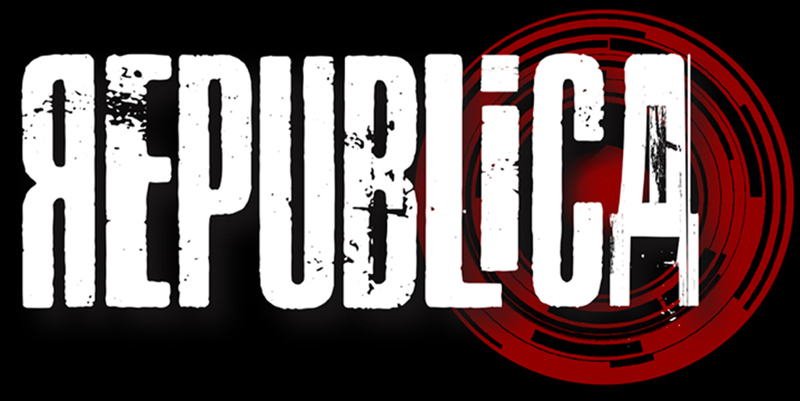 Whether you are a small local business or a large established company Republica absolutely loves to shoot this genre. Showcasing a few images from this one of my absolute favourite sets featuring the wonderfully collaborative Eloise. Together we’d been working on this concept for quite a few months until we finally brought it to life. We’d been looking to create an avant-garde concept with more than just a hint of darkness. Now the ruff collar, which was indeed central to the theme was made (very kindly) by my mum! Why not? Hopefully you’ll agree that it looks fantastic in these images. Eloise is a skilled makeup artist and she created this amazing look which in my opinion smashed our theme out of the ball park. Add some amazing poses to the theme and a little special sauce in Photoshop and we achieved (I’m delighted to say) a dark and creative editorial that was published in Femme Rebelle Magazine. Now just to clarify this was shot on a shoestring in a small room at my house. One light. A home made accessory (the ruff collar) coupled with a cheap pair of Ebay gloves and an old belt belonging to my wife. The point? Well the point is that you can make interesting and creative images on a small budget……….all you need is a great model and a little imagination. Now Eloise herself has taken her creative talents and opened a studio recently together with her partner. Hope you like the images as much as we enjoyed making them. Well it was actually a badly broken knee which you’ve probably heard me banging on about before now……….sorry ’bout that. I was absolutely delighted to get back to photography last June as you might imagine after a fairly long hard slog back to fitness. I use the term ‘fitness’ pretty loosely here as I reckon I was at about 70 percent recovery at that point in time. This image featuring the very lovely Beckii from this particular shoot is one I am very fond of. It was the culmination of a pretty long period of inactivity and really a feeling of uselessness on my own part………to start making images again felt absolutely fantastic. Now Beckii nailed this. I love the pose and the attitude. Lighting is a simple one light in an octabox boomed directly out in front and overhead set up. I love to light female subjects in this way. Sometimes a cross light pattern can be nice (and certainly more dramatic) but I love the flattering shadows that the overhead lighting gives. Hopefully you like the image. The knee is at about 90 percent these days (in case you were wondering). Pretty ironic title for me as my wife will tell you that I’m a stickler for the rules. To be fair though I don’t mind breaking a few in photography. It’s my art……..my rules. Don’t let anyone tell you that you can’t do this or that as it doesn’t follow the rules of photography. How would they know your artistic vision? I’ve seen a lot of squabbling online over various technicalities over the years. I stay out of it, and I do……….exactly what makes me happy. So what photography crime have I committed I hear you ask? Don’t worry it’s nothing too bad……….perish the thought. I sometimes shoot beauty images with the Canon 17-40L. Why would you choose this wide lens for portraiture? Okay well let me tell you WHY instead. I light images like this with the large beauty dish. The dish is boomed directly out in front of the subject’s face and tilted down at a fairly shallow angle. I use the sock on it for extra diffusion (I absolutely love the light when modified like this) and I place some white foam core at chest height to fill the shadows. The dish is placed extremely close to the subject at approximately the same distance as the diameter of the modifier itself. So the 22 inch beauty dish is placed at a distance of roughly 22 inches. This is a pretty tight working space as I’m sure you’ll agree. The wide lens comes into it’s own here allowing me to shoot from directly under the beauty dish (with the lens hood literally touching the bottom edge of the dish) now I know this might not be for everyone but it certainly works for me. A couple of things to note here though in case you were thinking of trying this technique would be to be very careful with keeping the plane of the lens level or flat to the subject………wide lenses can cause a lot of distortion if angled incorrectly and we don’t really want that…..well……unless it’s intentional of course. The last tip is regarding the lighting. By booming the beauty dish out directly in front in this manner you can adjust the height of the light up and down which in turn will give you deeper or shallower shadows under the nose, lip and chin. Adjust to your own personal taste. It’s easy and effective. This image of Ava was shot against a painted white wall at home. I hope you like the image and the technique. I’m getting back to my rule following reality now.